As many of you know by now, I’ve been teaching at the Berkeley Digital Film Institute since its founding. Many film directors have passed through my classes, and exactly . . . um, carry the two, OK, FOUR PERCENT of them understand when they start my class that staged violence needs a fight director. And before you start congratulating yourself for being in theatre and therefore knowing better, easily half of all stage violence is blocked without a fight director. Maybe more. Here’s why you need to hire a fight director for your film or theatre violence. Impact’s Romeo and Juliet. Seth Thygesen as Benvolio, Marilet Martinez as Mercutio, Michael Garrett McDonald as Romeo. Photo by Cheshire Isaacs. Violence by Dave Maier. They’re better at it than you are. I know you totally think you can stage that fist fight based on your many viewings of Star Trek TOS, but believe me, you can’t. Or, rather, you CAN; it just won’t be safe or look anywhere near as good as if you had brought in a professional. Here’s the deal: Ideally, you know the look that you want. But the road to get there is not necessarily a straight line. You don’t, for example, set up a stage punch exactly in the same way you’d set up a real punch. It’s not as simple as just not landing your punch. Additionally, every fight has a narrative. Do you know what the story of your fight should be? Do you know how to tell that story clearly? A fight director does. Nothing is more annoying, or pulls you out of a moment faster, than watching badly done violence. It can take a beautifully acted scene and throw it straight down the toilet. You can have all the honesty you want, but if your violence looks cheap and crappy, it’s going to obliterate all that honesty immediately. So, for the same reason you hire any other designer whose entire job is to know more about their area of design than you do, hire a fight director. It’s the difference between a badass fight and this. …….or you could just use your phaser. Still: KIRK RULES. Christopher Morrison getting thrown by Cara Gilson in Impact’s production of Zay Amsbury’s The Wake Up Crew. Violence by Christopher Morrison. “I can’t tell you how many stories I have heard or been privy to of actors getting physically injured because someone didn’t use a respectable fight director. Now when I say ‘respectable fight director,’ I mean someone with reasonable and up-to-date training, or even hiring someone in the first place. [Name] shared a story awhile back of a nonunion (sadly, most of these horror stories are peopled with nonunion folk) actor who had her arm broken and dislocated because the director didn’t hire someone and wanted an arm lock that was ‘real’ (ugh, I hate that term used in relationship to theatrical violence– you want ‘real,’ start a fight club). This director demonstrated on her and snapped her arm. She required surgery. All fights, no matter how well-choreographed or rehearsed, carry some measure of risk, like everything in life, but the better choreographed and rehearsed they are, the lower that risk is. If you’ve ever lived through an actor getting injured on your stage, knowing you did everything in your power to prevent that is a world of difference from knowing your actor has a puncture wound because you couldn’t be arsed to hire a professional. I’ve been lucky at my theatre to have worked with many wonderful actors who would never dream of ignoring a fight director’s instructions, but of course we always reinforce that with support from the director, fight captain, and stage manager. Everyone needs to be on board. 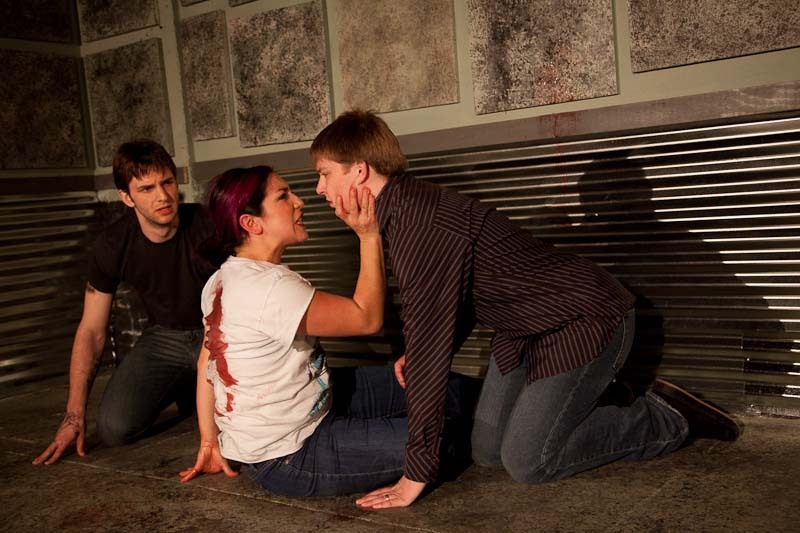 Stacz Sadowski and Anna Ishida in Impact’s Titus Andronicus. Photo by Cheshire Isaacs. Violence by Dave Maier. Yes, you can afford it. Carla makes an excellent point that nonunion actors bear the brunt of the foolery of the producers and directors who don’t want to hire a fight director. Why is that? Because the small theatres who work with nonunion actors are always looking for ways to keep costs down. I’m right there with you in the trenches. 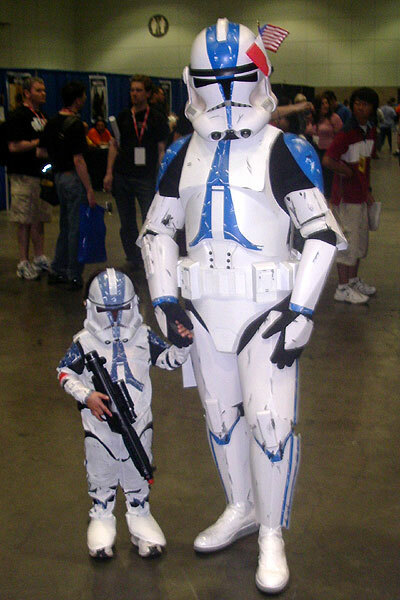 My company is the smallest of the small. No one at my company draws a salary. But we wouldn’t dream of doing a show with fights without hiring a fight director. We build it into the budget from the start along with every other design element. If I can do it with my microbudget, so can you. Obviously you want a trained, professional, certified fight director, but can you afford one? YES, dammit. A little research will show you who the big theatres in your area are using. While a small theatre is unlikely to be able to afford the kinds of rates paid by a LORT, perhaps that LORT fight director is willing to work with you on a sliding scale. If not, it’s almost certain she has a highly-trained associate or star student who’s qualified and talented but is early in his career and looking to build his professional resume. Is there an organization in your area that trains fight directors and actor combatants? 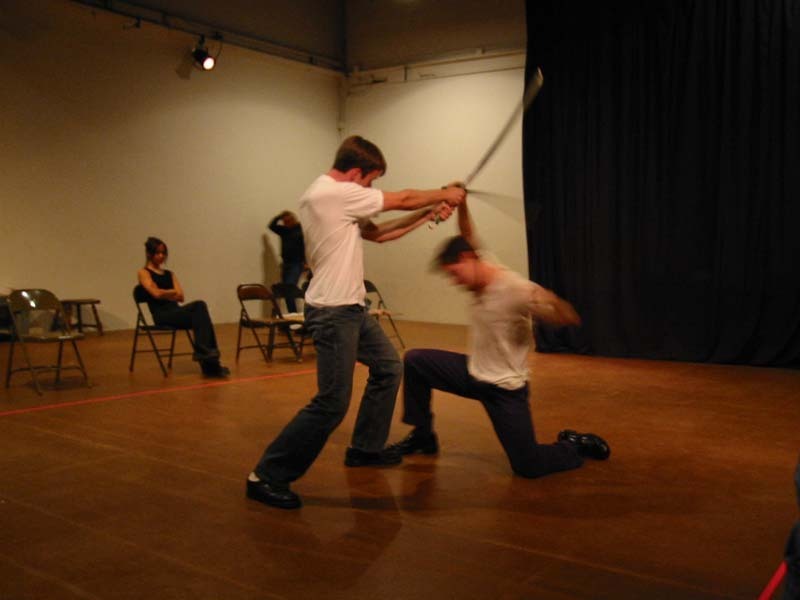 Is there a university in your area that offers stage combat training? A little sleuthing will reveal who teaches those classes. Don’t just assume that these professionals are out of your price range, even if your price range is $100 and a sixer of Pyramid Hef. YOU NEVER KNOW. No asky, no gety. But don’t skimp. Pay your fight director what every other designer is getting, because that’s what a fight director is: part of your design team. 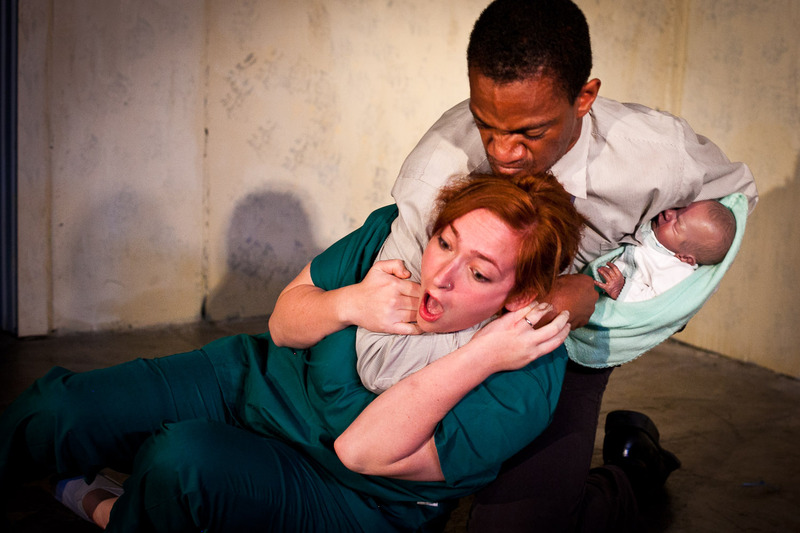 Reggie White and Cassie Rosenbrock in Titus Andronicus. Photo by Cheshire Isaacs. Violence by Dave Maier. What the hell do you mean by a “fight narrative”? Isn’t it just a fight? Ow, even typing that hurt me. This kind of attitude is all too common, and makes as much sense as asking why you should hire a lighting designer, because can’t you just turn the lights on and off yourself? Don’t avoid hiring a fight director because you think your actors don’t have the training to pull off a professional fight. A trained professional fight director will work with your actors’ capabilities. “While actors are amazing, we need direction. We need an outside eye to tell us if what we are doing is working. Safety is also nice. Fear is detrimental to our work as actors, not only fear of ‘is this working?’ but fear of being hurt physically. As a fight director, I am an actor advocate. My job is to help you portray violence in a convincing way in a safe manner, creating a fight with you and for you. A fight you will enjoy to do and can do well within your own abilities. It doesn’t behoove me to make you do a move you physically cannot do, a move you are fearful of, or hold you back if there is a special move you can do that can be highlighted in the fight. Rehearsing the Hotspur/Hal fight for Impact’s Henry IV: The Impact Remix. Violence by Christopher Morrison. A dulled blade is not magically prevented from doing any harm to anyone. It’s still a hunk of metal that can penetrate a squishy human body rather easily. And NEVER take your weapons out of the theatre unless they’re in some kind of case or containing device. Do you want three uniformed police officers and one plainclothesman charging downstairs into your theatre five minutes before curtain? Then make sure your actor leave his weapon on the prop table when he runs to the bathroom, not shoved down the back of his pants. All good troopers know to put their weapons back on the prop table when they’re off stage, and never touch anyone else’s props. So please hire a fight director. You CAN afford it. A qualified fight director will enormously enhance the quality of your show, keep everyone in your building safe, and open your eyes to new perspectives on work that you may, in many cases, have been turning over in your mind for years. When you finally get your hands on Lear (and by “you,” I mean “me”), a fresh perspective on those scenes you’ve been dreaming about blocking for a decade will not only make the violence better, but will provide fresh insights into the entire piece– narrative, themes, and characters. Stacz Sadowski and Miyaka Cochrane in Impact’s As You Like It. Photo by Cheshire Isaacs. Violence by Dave Maier. This piece wouldn’t be complete without a shout out to the fight director Impact Theatre works with– Dave Maier. Dave is brilliant. He and I see eye-to-eye about violence and tend to exacerbate each other’s love for stage combat when we’re working together as director and fight director. We’ve been known to turn the simple direction “they fight” into scenes that say as much about the characters as the dialogue, maybe more, and that’s something I would never, ever be able to do on my own. Working with Dave is a joy. I learn something every time I work with him, and his ideas about character and narrative are always fantastic. So hire a fight director. Be safe. Be a better artist. Be awesome. One of my favorite parts of the rehearsal process is when an expert (fight director, dialect coach, etc.) shows up to add his/her expertise into the mix. In my last play, my character stabbed another character to death with a pair of scissors that had already been established onstage as real scissors. It was enormously satisfying to get gasps and even screams from the audience. But the only reason a part of my brain could be available to enjoy that moment, rather than being overwhelmed with fear for the other actor’s safety, or consumed with embarrassment over the potential phoniness of the moment, was because we had worked with a fight director. As a Fight Director based out of Chicago, I thank you deeply. I second Carla on the sliding scale! All the fight directors I know really, really love to keep people from getting hurt, and most can be flexible in order to make that happen. His work in Richard III at Diablo Valley College was exemplary! Boston stage/screen fight/stunt choreographer here saying “THANK YOU!” I’ve seen so many injuries because they “couldn’t be bothered” or it was “cheaper” to do a stunt or fight without professional help. Yeah, most of us work to scale for the project, it’s our job to keep you safe! As a fight Director for stage and Film based out of MN I thank you too. I have said these same things many times as I am sure we all have. I can’t tell you how many times I have been told by directors that they were going to “Just Wing It” when it came to the fights. All of them have thanked me afterward for insisting on letting me do my job to make their film better. I have never had any director wish they had just winged it.The only thing I would add is this your Editor will thank you for hiring a Fight Director too as it makes cutting a fight scene so much easier when they are doing the same thing in each take. B.H Barry, Tony, Obie and Drama desk award winning Fight Director. and Book Two,Hamlet and Macbeth. Thank you for the post. I’m glad that this is making the social networking rounds. Good info to share. I’m a non-union actor, and I’ve seen so many directors/producers/other actors disregard their actors’ safety when it comes to fight scenes. (I actually had to tell a director once that if we didn’t have a fight call before every performance, I wouldn’t do the show.) I’ve been punched in the face during a rehearsal because we didn’t hire a fight director. I’ve seen actors get hurt, and actors be too afraid to speak up because they didn’t want to sound whiney. ABOUT THEIR SAFETY. And I love what you say about how fight directors are designers. Great fight directors are there to keep actors safe, create good choreography, and push the story forward. They’re invaluable artists and worth the investment. 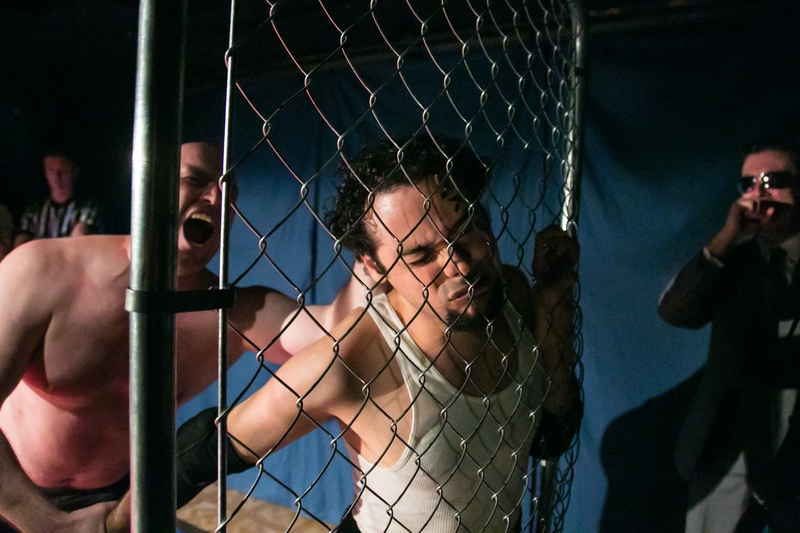 Oh, and another note: if you’re doing rapier work, don’t just use someone who has fencing experience. It’s completely different from stage combat rapier work. Thank you SO much for pointing out that actors should feel empowered to speak up about their own safety, and about how different fencing (and martial arts, for that matter) are from stage combat. There are so many more things to say about this subject. I knew I was only scratching the surface, and the post was already crazy long. I’ll need to do a follow-up one day! Thank you, thank you, thank you for your well written, in depth article. You have done a great service by hitting so many points about the importance of fight direction and the use of a professional fight director. As a professional fight director of 25 years, I’ve seen a lt of growth in the industry, but these things still need to be said. We are all in your debt. My hope is that this gets widely disseminated outside the stage combat community. This needs to be read by producers and directors, as they are usually the ones making the call. There is a point of excitation for all human beings that verbal communication becomes the secondary mode of communication and physicality becomes the primary mode of communication. This happens in intimate situations as well as violent situations. To complete the ascending action the playwright was intending in his/her work, the Fight Director ALSO serves as a playwright who writes with physical action. The fight is integral to the plot structure and Vice Versa. Working without a fight director is as bad as telling the actors to paraphrase Shakespeare in performance. This, apart from the safety issues, is just another part of the argument for.hiring a professional. Have you thought about a more formalized version being submitted to the various theatre journals out there? These kinds of things need to get disseminated to the directors and producers out there, who probably are not directly linked to the fight community. I’ve been a fight director since 1976, & this post is dead on! I remember years ago when I worked in Chicago, being called in by a theatre company in their final week before tech because their lead actress suffered a chipped tooth during a slap. They were making contact because the director wanted “realism”. I came in to show them how to do the slap safely, & then watched the run through. I was horrified to see another character stick what was a real revolver loaded with .22 blanks into the belly of another character, making contact, & fire. After the run-through I grabbed the director & the actor who was shot & asked the actor, aren’t you feeling any pain when he shoots you? He said, yes, but it helps him “feel the moment” (facepalm) I took the gun & went over to a empty cardboard box, & told the director & actor to watch. I fired a blank at the box & the wadding blew a 3″ hole in the side of the box. I then showed them how to stage the gunshot so the wadding went in a safe direction. That director was an idiot!! !